*Price includes all taxes, fees and fuel surcharge. Doors Off Kauai Helicopter Tour is an excellent overview and discovery to the most scenic parts of the Garden Island. 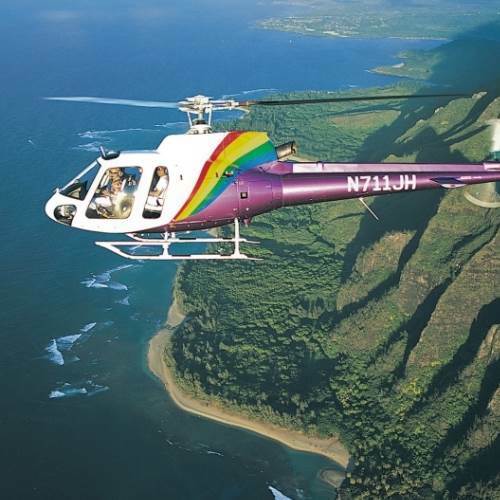 This 60-65 Minute Helicopter Tour is the most popular and excellent overview and introduction to all of Kauai’s scenic wonders and is our most popular tour length. Highlights the most beautiful and remote areas of Kauai. This hour plus Doors Off Kauai Helicopter Tour is an excellent overview and discovery to the most scenic parts of the Garden Island. This 60-65 Minute Helicopter Tour with Jack Harter is the most popular and excellent overview and introduction to all of Kauai’s scenic wonders and is our most popular tour length. This tour covers all of Kauai’s major scenic areas, the hovering and turning provides views from both sides. This tour is available in our A-Star Helicopter and Hughes 500 helicopters. The tours in the Hughes 500 is essentially the same as those flown in our A Star. Doors off is a thrilling way to see Kauai and get the best photos of the Garden Island. We do recommend that passengers bring a jacket or sweater, wear long pants and secure footwear when flying in the Hughes 500. No loose objects are permitted in the helicopter. Cameras must have a strong wrist or neck strap. Restrictions: Age restrictions: 10 years r older for doors off . Weight restrictions apply on all flights. For flight safety, weights will be verified at the office. Please provide accurate weight and height information. Cancellation Policy: 48-hr (before activity date) cancellation policy on ALL activities, except where otherwise noted. Yes it’s pricey but damn was it worth it. We took the doors off flight and loved it. Definitely bring long pants and a light jacket, you won’t be too warm. Our pilot inspired a lot of confidence, he had been flying helicopters on Kauai for 25 years. The weather was a bit wild, which led to a bumpy flight but it didn’t phase our pilot.